Can I modify my Razer Panthera Evo arcade controller like the older Razer Panthera arcade controller? Yes. You can change the artwork as well as the joystick top and buttons. The Panthera Evo arcade controller has fully accessible internals for easy modification. Please refer to the online master guide for instructions. Does the Razer Panthera Evo have an audio input /output port? Yes, the Razer Panthera Evo arcade controller has a 3.5mm audio port for stereo output and microphone input. Will I be able to control the audio volume from the Razer Panthera Evo arcade controller? Yes. Press the Audio Volume Control button to cycle through the levels of the Headset Port. You may also press and hold the Audio Volume Control button, and then flick the joystick upwards or downwards to increase or decrease the audio volume of the Headset Port respectively. You will hear a notification tone when the headset port volume reaches its lowest or highest setting. Will I be able to mute my mic from the Razer Panthera Evo arcade controller? Yes. Press on the mic button to mute or unmute the mic. The button will light up red when the connected headset's microphone has been muted. There is no audio when my headset is connected to the 3.5mm audio jack on the Razer Panthera Evo arcade controller. What should I do? If the controller is connected to the PS4, hold the PS button to access the Quick Menu. Then ensure the volume control for headphones is not muted and the output to Headphones is set correctly. What are the system requirements for using the Razer Panthera Evo arcade controller? The Panthera Evo requires a PlayStation®4 or PC* (Windows 7 and above) with a free USB port. Can I use the Razer Panthera Evo with my PC? Yes. Please make sure you are running Windows 7 operating system or later. You may also need to download the Xinput driver here. What is included in the box of the Razer Panthera Evo? The Razer Panthera Evo Arcade Controller and the Important Product Information Guide. How long is the USB cable on the Razer Panthera Evo? The cable on the Panthera Evo is 3 meters long. Is the USB cable on the Razer Panthera Evo detachable? No. However, the Razer Panthera Evo arcade controller has a compartment to stow the USB cable. What form of modifications (modding) to the Razer Panthera Evo is covered under Razer’s warranty? These modifications should be performed with only a screwdriver. Physical / Electrical damage caused to the arcade stick as a result of these modifications are not covered under Razer’s warranty. Can multiple Razer Panthera Evo arcade controllers be connected to the PS4 at the same time? Yes, you can connect up to 4 Panthera Evo controllers to your PS4. What does the Lock/Unlock switch do on the Panthera Evo arcade controller? Sliding the lock / unlock switch to the Lock position will disable the SHARE, OPTIONS, and PS Buttons. What are the Technical Specifications of the Razer Panther Evo? Approximate weight: 2.1 kg / 4.6 lbs. How does the Razer Panthera Evo differ from the Razer Panthera? Is the Razer Panthera Evo supported on USB 2.0, 3.0 and 3.1? The Razer Panthera is supported on USB 2.0 and later. Can I download a template and skins for the Razer Panthera Evo? 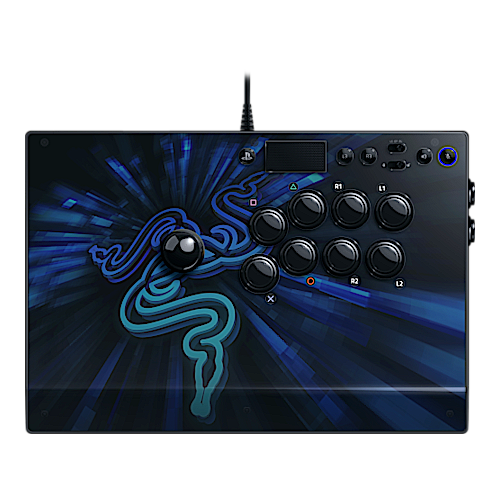 Yes, we have the template and skins available to download for the Razer Panthera Evo. Please visit https://www.razer.com/gaming-controllers/razer-panthera-evo. What is the MSRP of the Razer Panthera Evo? The Razer Panthera will retail for $199.99 USD. Can I use my Razer Panthera Evo on Steam as a PS4 controller? Yes, the Razer Panthera Evo is recognized as a PS4 controller by default on Steam. You just have to enable “PS4 configuration support” under Steam settings to use the Razer Panthera Evo on Steam. What size are the buttons on the Razer Panthera Evo? The main action buttons are 30 mm in size. The Options and Share buttons are 24 mm. What will I need to remove the balltop of the Razer Panthera Evo? You will need a flat head screwdriver to hold the shaft in place as you unscrew the balltop. Please refer to the online master guide for instructions. Will I need any tools to modify my Razer Panthera Evo? You will need a cross head screwdriver to gain access to the internal parts.